« caro to press: ask me something different! Which one doesn’t belong? 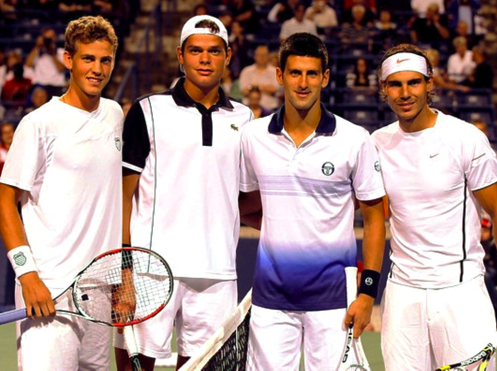 That would be the fella on the far left – Vasek Pospisil – who is the only man among these four pictured who isn’t still alive and well in the Australian Open draw. That other unfamiliar face – second from left – is one Milos Raonic, a 20-year-old Canadian who has advanced to the fourth round of the AO with a four-set win today over 10th seed Mikhail Youzhny. In six matches (including three qualifying wins), Raonic has dropped just two sets. He’ll face no. 7 seed David Ferrer in the Round of 16. This entry was posted on January 21, 2011 at 9:43 pm and is filed under australian open, canada, tournaments. You can follow any responses to this entry through the RSS 2.0 feed. You can leave a response, or trackback from your own site.